This blog, unusually, is about a US trip, not an international trip. 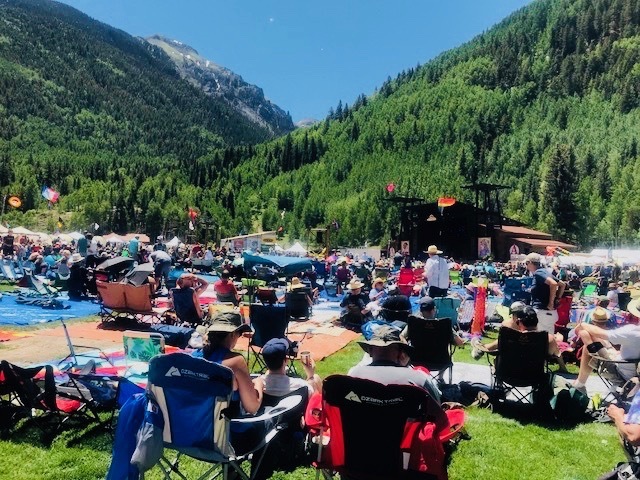 In June we went to the Telluride Bluegrass Festival in the high mountains of southwest Colorado. This festival at 9,000 feet has been attracting bluegrass music fans for 45 years. 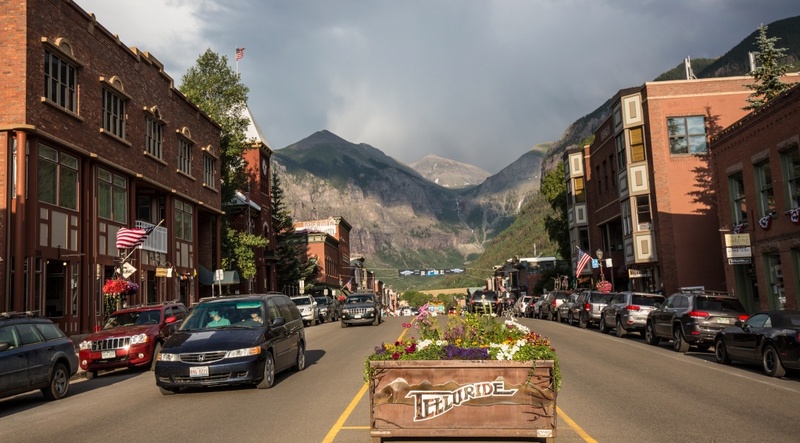 Downtown Telluride. © Flickr/Grant Uberglide. 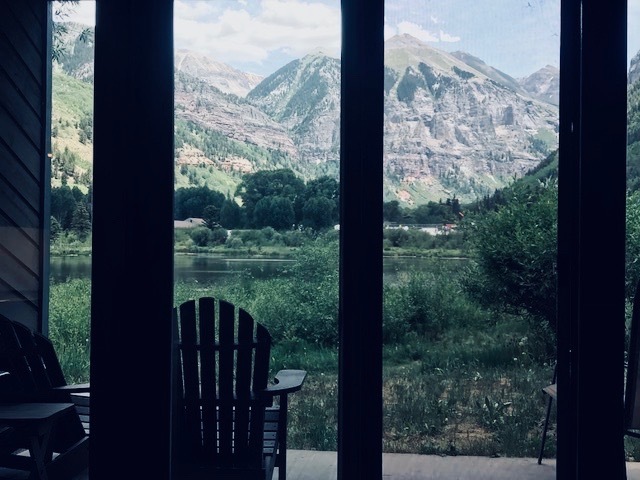 Fred’s college roommate Bill and his wife, Marsha, have gone to Telluride many times, and were great to make all the arrangements. Over 10,000 of your closest friends attend this festival, so prior planning year in advance is essential. We scored festival tickets a year ago and were not disappointed. 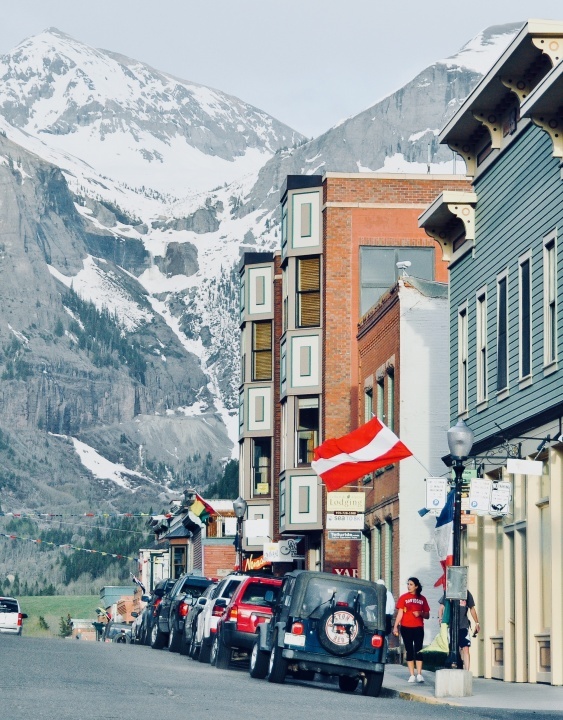 The mountains in Colorado are just as beautiful as any we see on our travels around the world. There are other pluses to such a stateside trip, including good roads and English-speaking (mostly) fans. And you can drink the water! A Happy Kid with Ear protectors. © Fred Lundahl. 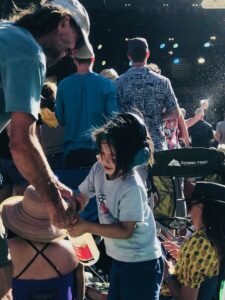 The festival attracts fans of all ages. There are lots of families with small children, as well as a range of bluegrass fans ranging from youth to seniors like us. The organization required of such a festival is huge. There is free sunscreen at the First Aid tent, as the hot sun at this altitude burns you quickly. Because of the current hot and dry weather, smoking is only allowed at designated areas outside the grounds. As marijuana is legal in Colorado, there are lots of warnings about watching the quantity of your edibles (i.e. gummy bears infused with you-know-what). Apparently, the high altitude makes them more potent. The music, of course, was great. Emmy Lou Harris still sings as sweetly in her 70’s as in the old days. The Nitty Gritty Dirt Band is as good as they were when we first heard them in the 1960’s. Bela Fleck played his banjo with a classical string quartet. 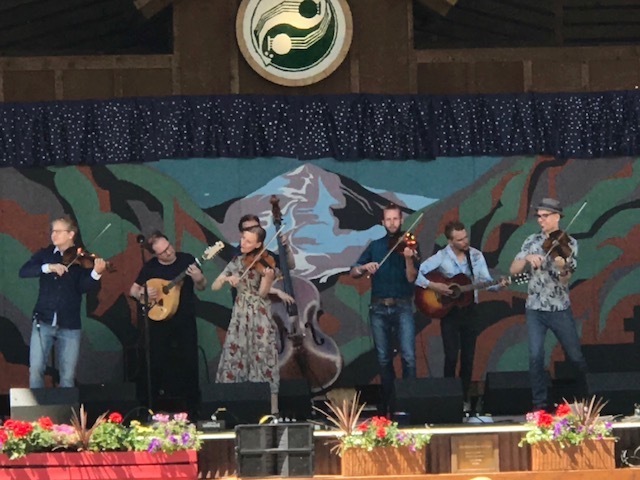 There was even an Irish bluegrass group that played four string tenor banjos rather than our usual five-string variants. 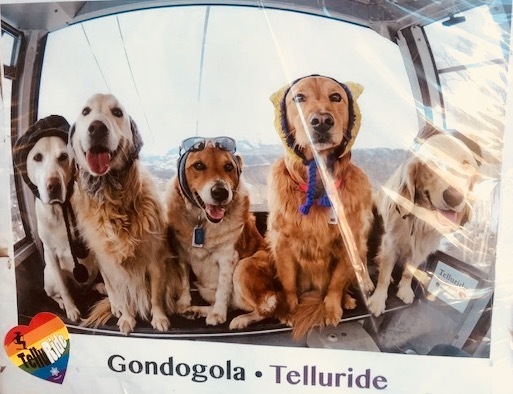 Postor Showing Dogs on Free Telluride Gondola. © Fred Lundahl. it no longer has scheduled service. Most people drive the long seven-hour trip across the rockies from Denver to the festival, as we planned to do. Those plans were disrupted by tornados and several-inch wide hailstones in Denver. Our flight was diverted and sent to Grand Junction, Colorado in the western part of the state. It turned out that that Grand Junction is actually about half the way from Denver to Telluride. Luckily, the Alaska Airlines people let us get off the plane with our carry-on bags and finish the flight there. Here’s to traveling light and not checking luggage! View of the Mountains and Performance Area from our Room. © Fred Lundahl. Grand Junction was fun and a hotel near the airport picked us up and gave us lodging for the night.. The next morning we visited a very neat “Museum of the West” in downtown. Not having a car, we decided to use the local bus service downtown to the museum and back. Getting on the bus, Fred discovered that a single ride is $1.50 and we only had large bills. As Fred and the driver puzzled over what to do next, a young woman, the only other passenger on the bus that early, overheard our discussion and insisted on paying for our ride to town and back with her own bus pass. Our friends picked us up at the hotel at noon, and we continued to enjoy our journey. We discovered that this was only the first of many kindnesses shown to us in Colorado. Thank you to Telluride and to that beautiful state of Colorado. Sounds wonderful Sharon. I attended a music festival at Breckinridge several years ago. Thoroughly enjoyed it and CO. Spent 15 days in Ireland and am now in Scotland for same time. Another great annual festival is in Galax Virginia, deep in the Blueridge Mountains. It is The Oldtime Fiddlers Convention. Will for sure, look into going to Colorado next year now that you informed me about it! Since I have a daughter, grand daughter and husband and great grandsons in Colorado I have no excuse for not taking in this festival. You surely made me want to. Thanks so much. Just returned from Scandinavia where the mountains are beautiful, the water is pure and they speak perfect English. We made some new friends from Colorado too! Yup. It’ a great experience – made even better by seeing our (mature) old friends. sounds lovely and unique. Glad that u enjoyed the trip. I always look forward to and enjoy these travel and learning experiences with you and Fred. Thank you Sharon.